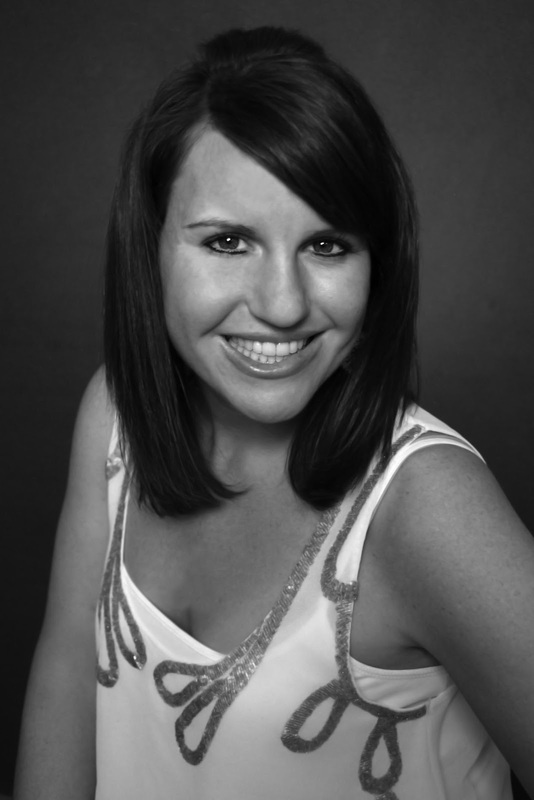 Today, I would like to welcome Gwendolyn Heasley, author of Where I Belong, to The Serpentine Library. Where I Belong is a contemporary riches to rags story about how one spoiled Manhattan teenager learns to deal with the effects of the recession on her life. 1. As much as I like Corinne, and I do like her a great deal, I loved her grandparents, especially Grandpa. How would he describe Where I Belong? Where I Belong is the true story of how my granddaughter Corrinne found her Texan roots and got rid of her Hudson River view of the world. Basically, it’s the story of how she went from a teenager to a young woman. 2. What type of research did you do for Where I Belong? I live in NYC and I watch Gossip Girl, so that helped me created NYC Corrinne. For the Texas Setting, I drew from the fact that I have a lot of Texan friends, so their Texan pride helped me to create my loveable Texan characters with their quirky names and colorful language. Also, I have been to Texas several times, so that of course helped. Youtube.com filled in A LOT of gaps. For instance, what mutton busting is and what dressage is. I loved doing the research bit since my degree is in journalism! I only wish I had time (and money) to do even more further research- especially of rodeos! 3. I have this thing about names; I love hearing the stories behind them. How do you come up with names for your characters? Real people definitely inspire my character’s names. I have a friend Corrie, who’s real name is Corrinne. She’s the inspiration for Corrinne’s name. (Coincidentally, my now-boyfriend is also named Cory!) Let me run on a tangent for a second: Some readers say they don’t like Bubby’s name because it means Grandma. I’d like to say that I have met boy Bubbys, so it doesn’t just mean Grandma! I like Bubby as an adorable nickname! For some of the other names, I googled. Somewhere in the world, there is a Kitsy who competes in rodeos. (Kitsy is my favorite name by the way- if I ever have a girl…..) The rest of the names I pretty much just made up! 4. If you could have a character from any other book join Corinne and Tripp in Broken Spoke, who would you choose? Those vampires from Forks, Washington. I want to see how they’d do in Texas heat! And I want to see if they’d fight over Corrinne like they did Bella! 5. Would Corinne be willing to share some of her favorite recessionista tips? Yes, Corrinne would love to share how to be a recessionista in NYC. Her first tip is don’t take cabs. It costs almost three dollars just to get a cab with no mileage! She also thinks staying in Jersey City or Hoboken as a tourist is a great idea. Both cities are only one subway stop away from the tony West Village and you will save hundreds of dollars in hotels. Corrinne also recommends hiring younger siblings to do services for you. Since they are related to you, you are allowed to pay less than minimum wage and stiff them on the tips. Kidding, sort of. A big thanks to Gwendolyn and Corinne (for sharing her tips)! For more information about Where I Belong, check out Ms. Heasley's blog. When sixteen-year-old Lark Austin is kidnapped from her Virginia hometown and left for dead in a snowy forest, she leaves behind two girls who are shocked by the loss of their former friend. At the same time Eve must face the hole left by Lark’s absence, she also can’t shake the guilt that Lark’s death was her fault. Meanwhile, Nyetta is haunted by Lark’s ghost, who comes through the bedroom window and begs Nyetta to set her soul free. Eve and Nyetta realize it is their responsibility to uncover why Lark is trapped in limbo, but only by coming together to find the missing pieces of themselves can they bring peace to Lark. 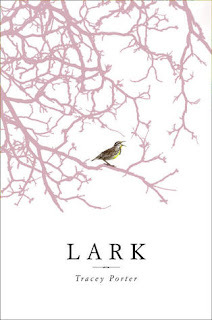 To be honest, it was Lark's cover that drew me in and made we want to know what this book was about. The small bird and the tree branches against the start white background will definitely stand out on the shelf. Then, I read the summary. I'm usually not one for ghost stories, but the description sent chills up my spine. It does remind me a little of The Lovely Bones, but Lark seems to focus on friends instead of family. I'm preparing myself for a dark, emotional read, but I holding out for some hopefulness too. What book are you eagerly waiting for this Wednesday? A book that will resonate with people who have been affected by the recession and those who have found themselves in new situations, Where I Belong is a book about what happens when life as you know it ends and you have to pick up the pieces. Where I Belong starts with a letter from its main character. She tells the reader that she was a “teenage ice princess,” that takes guts. A person has to pretty brave to just come out and say, hey I wasn’t that nice of a person but give me a chance because this is the story of how I changed. And that’s basically what Corinne does; she chronicles her life from her glamorous and privileged life in Manhattan to her after recession life in Broken Spoke, Texas. Corinne pretty much gives the reader an excuse to dislike her - she really wasn’t that nice in her before recession (B.R.) life: she ignored her brother, treated her parents rudely, she didn’t think beyond herself or her immediate circle of friends and she was all about spinning information so that she never came out on the bad side of gossip. Despite all of that, I found myself actually liking Corinne. Sure, she wouldn’t be someone my teen self would have been friends with but, I would have admired how she took charge of her life and didn’t let other get her down. Also, Corinne did have some good qualities - she was loyal to her best friend, Waverly, and her horse, Sweetbread, and she did work hard, granted it was towards having the perfect wardrobe, but underneath it all a work ethic was there. You really feel the panic Corinne goes through when she realizes that her life is going to change and that a lot of what is important to her will be gone. Texas, more accurately Broken Spoke, is a shock to Corinne. A very small town with one main street, a Sonic and one Chinese restaurant; it is the polar opposite of Manhattan. 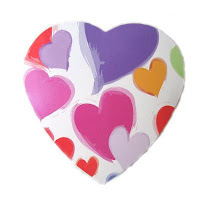 Corrine arrived in Texas with the attitude that she did not want to be there and a plan to get back to her old life as quickly as possible. As understandable as feeling that way is, I was really happy when her feelings about Broken Spoke started to change. I really liked seeing Texas through Corinne’s eyes. Never having been to Texas, it was easy to picture what Broken Spoke looked like. Almost everyone in Broken Spoke was welcoming and I enjoyed seeing Corinne’s friendship with Kitsy evolve from Corinne tolerating her to them becoming close friends. In addition to finding great friends, Corinne gets to know her grandparents. Corinne moved to Texas not really knowing them, in fact she had only met them a handful of times. I love teen-grandparent relationships when they are portrayed well and Gwendolyn Heasley did a great job of showing Corinne getting to know and loving her grandparents. There are some fantastic scenes of Corinne and her grandfather as he attempts to teach her to drive. I have to admit that they were among my favorite scenes in the book. Where I Belong is a fun contemporary novel about finding your way through a new and scary situation. It’s a great “fish out of water” tale that will resonate with a wide range of readers. Publication Date: UK - January 6, 2011, US - ?? What an infuriating book! And I mean that in the best possible way. Does that make any sense? Let me explain. Grace wakes up to find her herself in a white room with white everything and three reams of paper and lots of pens waiting for her on the desk. She’s pretty sure how she got there; she just doesn’t know where she is or why she’s there. Grace wonders why her kidnapper, Ethan, (who looks familiar to her although she can’t place how she might know him) is being so nice to her. Not sure what else to do, Grace writes about her best friend Sal and boyfriend Nat. Through her writing Grace looks back and uncovers truths that ultimately led her to her current predicament. So, Entangled is one of those books where the cover copy really doesn’t explain the book at all and in this case I was happy about that because I was expecting a different story than the one I read. And to be honest, I really much rather prefer the story I read to the story I was expecting. Grace is a train wreck of a girl. She’s clever, beautiful, impulsive, sad, madly in love with her boyfriend Nat, occasionally happy, and not sure about her relationship with her mom. I liked her from the first page or on day three of her ordeal because that’s where the book starts, and found her journey to be fascinating. Starting on day three, made me wonder what happened those first two days and why Grace didn’t tell us about them. I found the initial setting of the white room to be a genius choice because it forced Grace to fill the space with her story. But, at the same time, the room felt like a blank slate, a chance to start over; a way for Grace to identify and fix what wasn’t working in her life before. As Grace writes, the reader is introduced to Sal and Nat, her best friend and boyfriend respectively. Through her relationships with them, the reader learns a lot about Grace and how she deals with life. Grace’s voice felt real and I never doubted for a second that she was an actual teen dealing with problems many teens face. About more than relationships, Entangled deals with some tough subjects - depression, suicide, cutting, and teen pregnancy are all touched upon by Grace as she writes. At times, it was a hard book to read. But, it was also one of those books that worms its way into your head so that it’s all you can think about for days, even after you've finished reading. It was a book that made me laugh and cry, okay I cried more than I laughed and the last 20 pages or so tore me to pieces, but I had to make it through so that I could find out how Grace’s story ended. 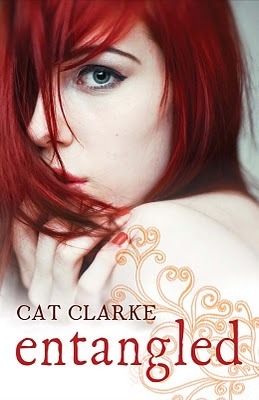 Entangled was a dark, engrossing read. It was a book I couldn't put down and when I got to the last page, I wanted to know what happened next. It was a fabulous debut all around. I can’t wait to see what’s next for Cat Clarke. 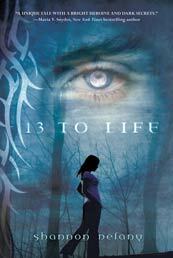 I'm very exciting to be a part of the MAX-imum Exposure Tour for Shannon Delany's 13 to Life series. 13 to Life is such a fun book, who doesn't love to read fun books?! 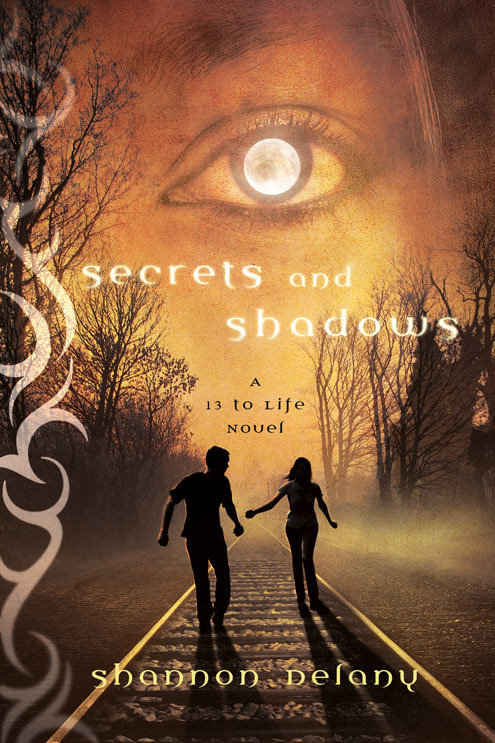 I read 13 to Life last summer when it came out and can't wait to start Shadows and Secrets! Last week, I got to meet Shannon Delany at a signing at the very lovely The Voracious Reader bookstore, where she read from Shadows and Secrets. From the scene she read, it's obvious that Shadows and Secrets will be every bit as fun as fun as 13 to Life! Each site throughout the tour will have swag and an individualized interview with either Pietr, Max or both! Shannon has also included an audio download for each interview so you can hear the Rusakova boys! On 2/12 Pietr, Max and Shannon were on blog Talk Radio with host Barry Eva, you can find the interview at http://www.blogtalkradio.com/across-the-pond. I have to admit that Pietr is my favorite Rusokova and I was excited to get the chance to interview him. However, thanks to a technical issue I was only able to ask Pietr one question, but I think it's a good one! Hi Pietr, thanks for taking the time to visit and answer some questions. You Rusakovas seem like such a tight knit group. Do you have a favorite sibling? Da, we do seem like a closely knit group. I definitely relate better to Cat than to Max and, well, Alexi’s shown himself to be less of a true brother than we ever expected. Cat is my favorite sibling--she is the one I can talk to about anything. What are your top 5 favorite Shakespeare plays? When it comes to picking favorites, I fail. Even with ice cream. Some days it’s coffee, other days blackberry, and often chocolate. So I’ll just write about the plays I particularly enjoy. Forgive me for shirking the question! After reading Julius Caesar and Macbeth early in high school, I hated abhorred Shakespeare. The plays were hard to understand. But then I read King Lear senior year and fell in love with the language, the imagery, and the story. I don’t know why I had a breakthrough then. Age, maybe? Plus we read it aloud in class, which breathed some life into it. Before that, I saw a movie version of Romeo and Juliet that sucked me in. The balcony scene turned me into a puddle. I loved the tragic romance of it all, of course, but the intensity of the drama took my breath away, too. It didn’t matter that I knew how the story ended. I still think the movie versions of his plays are amazing. Other Shakespeare plays grew on me over time. My first experience with Hamlet dragged a bit. I wished Hamlet would do something, avenge his father’s death without debating it forever. But later, after realizing how hard it can be to act on one’s feelings, I related to Hamlet’s hesitation. Not all of us are cut out to be warriors. After I started writing My Invented Life, my local high school staged A Midsummer Night’s Dream. When I found out, I wrangled an invitation to their rehearsals. What a fab experience! It made me totally mad for the actors, and for the play. I used a few of the things I observed in my story. I chose As You Like It (one of Shakespeare’s more obscure plays) for my novel because of the strong and wise Rosalind. She’s not shrewish, half-mad, or ruinously ambitious. She runs away to save her life, dresses as a man, woos her love interest while in disguise, and joins her father in rebellion against his evil brother. As a bonus, I had a mini-crush on the boy who played Orlando in a production I once saw. If When my book is made into a movie, I want someone else to do the casting! One time, I tried to cast it myself. You can read my attempt on the blog: My Book the Movie. Thanks so much for stopping by The Serpentine Library, Ms. Bjorkman! Make sure to come back next week when she stops by again to share some of Roz's rules for love and friendship! Azalea and her 11 sisters are supposed to be in mourning for their mother - complete with darkened windows, black clothing, no visits or fun of any sort especially dancing. With their father, the King, away at war, the girls slip out of their room every night to dance in a magic realm. There they meet Keeper, who seems intriguing but has intentions that aren't exactly honorable. Azalea finds that she must work out Keeper's mystery in order to save her family and their kingdom. So, I may have mentioned that my favorite fairy tale ever is The Twelve Dancing Princesses. The first time I heard it was during a Pre-K story time at the library and I instantly fell in love with it. I checked it out of the library a lot. Then someone gave me a paperback picture book copy as a birthday present. Once I was able to read well enough on my own, that was my go to book. It was literally falling apart when I finally put it away to expand my reading horizons. Despite my love for The Twelve Dancing Princesses (or The Worn Out Dancing Shoes/The Shoes That Were Danced to Pieces) I'd never read a retelling until recently (for YA Lit class last semester). 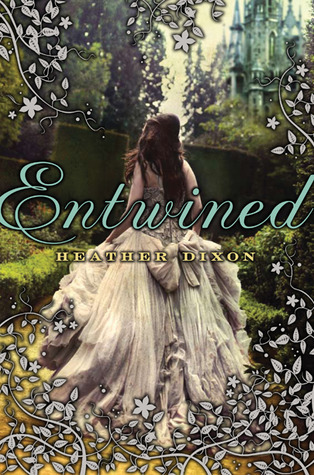 So when I heard that Entwined was another retelling, I knew that it would go on my wishlist for this year. Maybe my love of the original tale made me biased as I was reading, maybe it made me more critical, but overall I loved Entwined. Were there things that I wasn't fond of? Yes, (all the flower names for the sisters, for example) but the great parts outweighed them in my opinion. Since Entwined revolves around 12 sisters, I thought it would be fun to give 12 reasons why I enjoyed reading it. 1. The sisters - with so many of them, it was sometimes hard to keep them all straight, but the portrayal of their relationships, squabbles, and interactions felt very genuine. 2. Lord Bradford - he's pretty swoon-worthy. At one point while reading I decided he was unassumingly dashing, because even though everyone else knows how awesome he is, he seems to be oblivious. 3. The dancing - the way Ms. Dixon describes each dance makes them seem like additional characters in the story. 4. Azalea, the Princess Royale and oldest sister, she's strong and compassionate and looks after and stands up for her sisters. She's also courageous in that she stands up to the King and doesn't let him off the hook for anything. 5. There is magic, but only in small quantities. Only certain parts of the castle are magic and even that is considered a myth until Azalea finds the secret passageway. But also, there is the realization that love is its own type of magic. 6. There is character named Mr. Pudding. For some reason, I just love that name! 7. A certain pocket watch and the theme of time: the passage of time, waiting for something/someone you love. 8. Prime Minister Fairweller - despite his sober demeanor and rule abiding ways, he has a bit of a romantic streak. 9. A mention of treacle tart - in addition to reminding me of Harry Potter, it just shows how it's all the small details that make the house and the magic realm come to life. 10. A certain scene between Azalea and Lord Bradford involving a closet and some spying. 11. Lord Teddy - my favorite of the suitors - he unintentionally delivers comic relief exactly when it's needed, plus he never gives up! 12. Keeper is super creepy as a villain, right from the first sight of him it's very clear that he is evil. I love villains that are unapologetically evil. 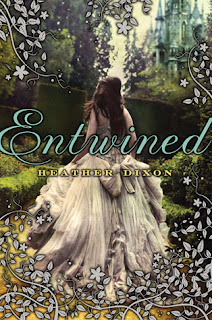 If you enjoy reading fairy tale retellings, Entwined should be on your radar. I definitely will be picking up a finished copy at the end of March. What would you do for your sister? How far would you go to make sure she was happy and with the person she loved? Sisters Roz and Eva used to be close, until Eva pretty much deleted Roz from her life a few months ago. Roz knows that something is going on with her sister, but doesn't know how to figure out exactly what it is. Dramatic and prone to random acts, Roz dreams of getting the lead in the school play, As You Like It, and maybe stealing Eva's boyfriend. In an attempt to get Eva to open up, Roz invents a girlfriend. Soon, the school is buzzing about Roz and Eva is irate. From an unexpected source, Roz figures out that just maybe by paying more attention to what is going on around her she might find out how to help Eva. 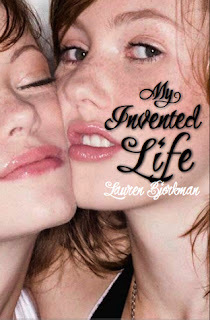 The first time I read My Invented Life, I wasn't sure what to expect. I initially picked it up because it was a 2009 debut, but I was very happy that I did. Reading it for a second time with the knowledge of how everything turns out, I found myself even more drawn into the story. Ms. Bjorkman does a great job of showing just how confusing high school can be for certain teens and that having people willing to help you navigate the confusion and uncertainty can make all the difference. She also includes a wide range of characters, so that almost all readers can find someone they relate to. Told from Roz's point of view, My Invented Life included a funny, updated look at As You Like It. I really liked Roz as the main character, even though she was overly dramatic, a bit of a blabbermouth, and oblivious to a lot of what was really going on around her. Her sister Eva, on the other hand, is more reserved and quite private. Much of the conflict between the sisters comes out of them having different personalities. It was obvious just how much Roz loved Eva and how much it hurt when Eva literally deleted her from her life. The lengths she went through to find out why Eva froze her out really got across just how much she wanted them to be okay again. The scenes where it was just the two of them were my favorites because you could see how much of Roz's self-worth and confidence was tied in to being compared to and being rivals with her sister. Even though Roz and Eva were the central pair, the other characters felt very real. Each of them was unique and the group together really captured the range of personalities that can be found in high school. It was interesting to see the changing pairs and the dynamics each pair brought to the story and to their interpretation of As You Like It. Throughout rehearsals, acting lessons, and chat room conversations the reader really gets to see each character's true personality. My Invented Life was a quick read that dealt with heavy topics in a funny, lighthearted manner. I would not hesitate to recommend this book to lovers of Shakespeare, humorous stories, or those who are looking for a book that deals with identity and figuring out exactly who you are. Ruby and the Congregation spend their time collecting water under the direction of watchful and cruel Darwin West and his Overseers for the mysterious Visitor. In the woods, where they work and live, time has stood still and the Congregation lives exactly as it did in 1812 - in sparse one room cabins with no running water or electricity. They are waiting for Otto, their leader, to return to the woods and save them. Routinely beaten and starved, the Congregation toils through one of the driest summers upstate New York has ever seen to gather their quota of water each day; water that Ruby turns into Water. This summer a new Overseer begins working for Darwin, he is different from the other Overseers and much like Ruby is stuck in a situation he has very little control over. As they get to know each other, Ruby starts to see that maybe she does have some say in how she lives her own life. Drought is a book that raises a lot of questions. And it was difficult at times to read because it didn't give many answers. Every chapter brought more questions and few answers. My biggest and most persistent question was, why did the members of the Congregation allow themselves to be enslaved? Because that's what they are: Darwin's slaves - he decides how much Water they are required to collect every day, if they get to eat, and who will be beaten when quotas are not met. Ruby, because of her special blood, is enslaved twice - once to Darwin and once to the Congregation because they rely on her to change the Water which slows down their aging and heals them. You would think that after a reasonable amount of time had passed the Congregation would find some way of rising up against the Overseers and escaping the forest. I have to believe that it was their faith and belief that they would be saved, by Otto, from their predicament that kept them going day after day. Another threads in the story include choice and faith. Throughout her life, Ruby has shouldered a great responsibility. She's not exactly happy with her life, one that has been mapped out for her, but she doesn't know any other way of living. And even though she dreams of escape, she repeatedly makes the choice to stay. Then she meets Ford, the newest Overseer. He makes Ruby question her life in the forest and her faith in Otto. The romance part of their relationship, was odd to me and it felt like Ford was interested in Ruby because she was the only person on the mountain (and in the forest) that appeared to be close to his age. But, I found their conversations to be really interesting. Through Ford, Ruby gets to see that the world outside, off the mountain, has gone on, that her life could be so much more than it is. I kept wanting her to take the next step and mount some sort of rebellion, to stand up to her mother and the Congregation at least, even if she couldn't stand up to Darwin. I felt that the world Ms. Bachorz created was downright scary. I would not want to stumble across this patch of forest. The Congregation's isolation was believable and frightening and reminiscent of some of the communities we hear about on the news from time to time. Many of the characters were hard to like, especially Darwin. He is definitely in a class of his own when it comes to his cruelty and (extreme lack of) people skills. Ruby's mother, Sula, was another character I had a hard time liking, mainly because I blame her for the Congregation's isolation. Even Ruby had her moments when I wanted to reach through the pages and have a heart to heart with her, so I could tell her to start listening to her instincts, that it was okay that she was questioning her beliefs. I found myself really routing for her and wanting a good outcome for her. I wanted to know more about the other members of the Congregation and wished that they had been fleshed out a bit more. Overall, I did enjoy reading Drought, despite not getting answers and all the open questions. The ending was very open ended, that's all I'll say about that because I don't want to spoil it, and it left me with a bit of hope. 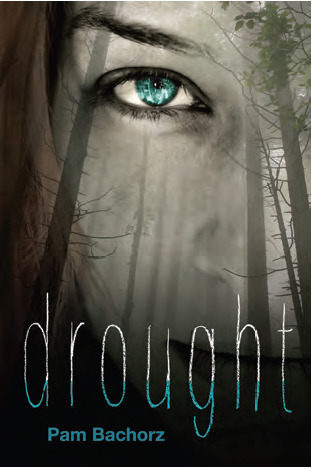 I would recommend Drought to readers who like their stories dark and their heroines conflicted.